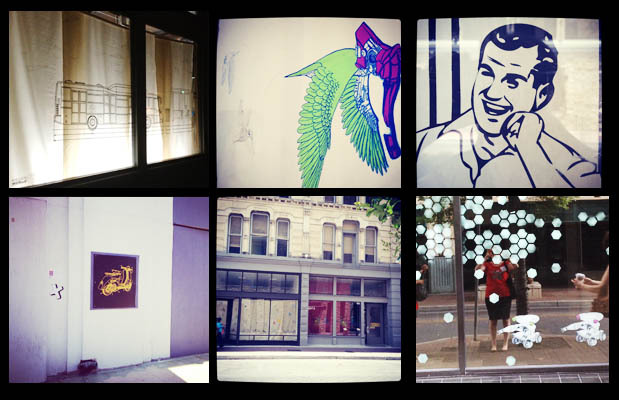 A series of art interventions Aaron Muñoz occupied vacant storefronts along E Houston St. from June through December, 2012. The installations explored transportation at the crossroads of biology and technology. Aaron Muñoz was born in 1982 in central Texas. He received his BFA from Texas State University in 2006. He received his MFA at the University of Texas and San Antonio in 2010. He is currently a professor at NortheastLakeviewCollege, teaching Digital photography. Aaron has been an exhibiting artist since 2003 exhibiting in Austin, Dallas, Houston, and San Antonio and Austria. INDULGD "Empty storefronts transformed into beautiful art installations"